Jesus is Lord over everything. So his lordship should shape every aspect of life. But what impact does faith really have on our day-to-day existence? 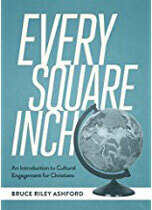 And how should we, as Christians, interact with the culture? In Every Square Inch, Bruce Ashford skillfully navigates such questions. Drawing on sources like Abraham Kuyper, C. S. Lewis, and Francis Schaeffer, he shows how our faith is relevant to all dimensions of culture. The gospel informs everything we do. We cannot maintain the artificial distinction between sacred and secular. We must proclaim Jesus with our lips and promote him with our lives, no matter what cultural contexts we may find ourselves in.